Stabilizing populations of Eastern wild turkeys in southeast Oklahoma is at the heart of a new state turkey hunting rule change that will go into effect in the spring of 2012. 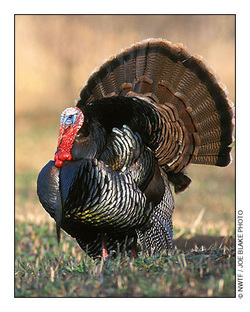 The rule change, approved for 2012 along with several others by the Oklahoma Wildlife Conservation Commission at its February meeting, will shorten turkey season in the southeast turkey zone and on wildlife management areas in that zone. The season will begin the Monday following the third Saturday in April and will run through May 6. Additionally, season bag limits in those southeast counties will be reduced to one tom total. The southeast turkey zone consists of Atoka, Choctaw, Coal, Latimer, LeFlore, McCurtain, Pittsburg and Pushmataha counties. Biologists say the timing of detrimental weather conditions and the resulting effects on habitat in recent years are to blame for turkey population declines in southeast Oklahoma and neighboring states to the east. Extreme drought in 2005 and 2006 reduced insect populations and vegetation, both of which adversely affected the wild turkey diet in southeast Oklahoma. But extremely wet springs in the years that followed had negative impacts on nesting success. Officials with the Oklahoma Department of Wildlife Conservation say the measure will not only help reduce the overall harvest at a critical time for wild turkey populations in southeast Oklahoma, but the rescheduling of the hunting dates for a later and shorter season will also reduce disturbance of nesting hens and could lead to better breeding success. The Commission also approved a number of proposed fishing-related rule changes designed to create more fishing opportunities and simplify regulations. However, two proposals were adjusted as a result of public comments collected by the Wildlife Department. One would have required boaters to remove all aquatic nuisance species from boats, trailers or other gear immediately after leaving a body of water, but the language was clarified to state that boats must be free of aquatic nuisance species before entering a body of water. Additionally, a proposal to prohibit the transport of shad out of the state was withdrawn for further review. Look for complete details of all hunting and fishing rules in the next Oklahoma Hunting and Fishing Guides. In other business, the Commission accepted a donation of $20,000 from the Oklahoma Zoological Park and Botanical Gardens for the conservation of native flora and fauna species. The donation is possible through funds provided by the Oklahoma Zoological Society and will be used to meet certain expenses associated with conservation projects in which the zoo offers volunteer assistance. The Commission also removed Raymond Gary from the list of Wildlife Department properties that require a Wildlife Conservation Passport to access and added the newly acquired Grady County Wildlife Management Area to the list of properties that require the Passport. Oklahoma hunting and fishing license holders are exempt from Conservation Passport requirement on all Department properties. Richard Hatcher, the director of the Wildlife Department, recognized Bob Mullinax, game warden stationed in Love Co., for 35 years of service to the Wildlife Department. Throughout his career, Mullinax has been an active law enforcement instructor for the Wildlife Department, other state agencies, county sheriff’s offices and police departments and academies. He has instructed courses in firearms, defensive tactics and law enforcement defensive driving, among others. Additionally, the Commission approved minor housekeeping changes to the Wildlife Department employee handbook. The next scheduled Commission meeting is set for 9 a.m., March 7, at the Oklahoma Department of Wildlife Conservation headquarters (auditorium), located at the southwest corner of 18th and North Lincoln, Oklahoma City.